Ahh Sunday, bloody Sunday! They never used to really get me down at all but lately Michelle and I have been having some epic weekends, which means I really do not look forward to work on Monday morning. Mondays to Fridays are a mere speed bump in my road to chilling out and having fun with mates on Saturday/Sunday. We stayed in on Saturday night and I am pretty sure I was in bed around 1am or so. Not too bad for a quiet one, right? I woke up pretty early again on Sunday morning and tried to force myself to stay in bed to at least 9am or so. 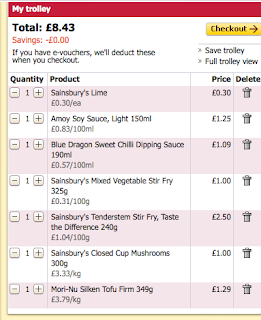 Once I was up, I pottered around the house and then decided to go to Sainsburys to sort out my lunches for the week. It was great to get out of the house for a while. I was starting to get cabin fever as we had been in the house since around 5:30pm or so on Saturday. When I came home, I made up all my lunches, then sat down to catch up on some blog stuff..... and..... decided to go for a run! 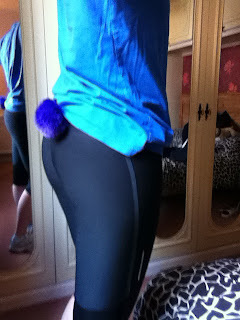 Yep, it's the return of the fluffy purple tail. Aww yeah!! It must look pretty funny as I am jogging down the road. I decided after running around the hills in the park yesterday, that I should go for a bit of an easier jog along the mostly flat road up further north. It felt good and although my fitness let me down a little bit, my legs felt strong and I relied on them heavily to get me home. YES! This IS the best stretch ever and I love the Sailor Jerry posters we are acquiring on our walls at home. Michelle finally bought a third one for our wall - our house is becoming a home! Now, since I spent most of the weekend in the kitchen, why would I want to get out now? Pfft... Yes, more cooking on Sunday! Michelle and I really wanted to try and make a dinner with tofu so we decided to get inspired by a cookbook we bought yesterday. 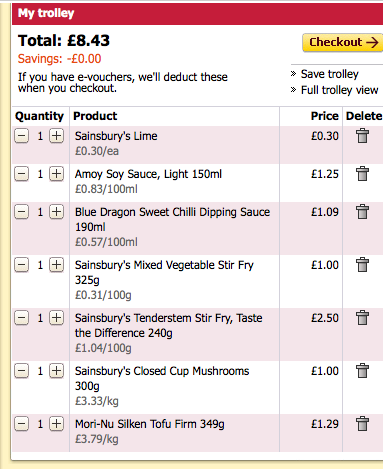 Here was our Sainsburys shopping list. We already had limes, sweet chili sauce and light soy sauce in the cupboard (I think most of you might have this as well) - so again, the meal will be cheaper. Even so, less than a fiver for a healthy dinner? Sounds like a good plan to me. We prepared the tofu right from the carton. I rinsed it under the tap before toweling it dry. Random I know, but someone told me once I had to do that. I listened! I made up a really simple almost batter type thing for the tofu with cornflour, paprika and garlic (which again, we already had in the cupboard). We fried the tofu in some vegetable oil in our pan. Once it was "golden brown" or slightly burnt as per the picture above, we took it out and placed it on the side. 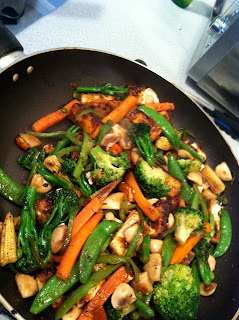 Once the veggies had cooked for a while we added the sauce we made from lime juice, sweet chili sauce and light soy sauce. It was a bit of a mish mash really, a spoon of this, a spoon of that, squeeze of this, dip the finger in and add whatever you want to add more of - go for it! We tossed everything around the pan for a few minutes to make sure it was cooked through and hot. We will be making this recipe again for sure. I think it needs a few tweaks to the tofu cooking part, but not bad for a first attempt. I encourage you to try and cook with tofu. It was pretty fun and if you experiment, it just makes things even more interesting. I love playing around with food more and more these days and am slowly getting some confidence with regard to cooking in front of other people. Have you cooked with tofu before? 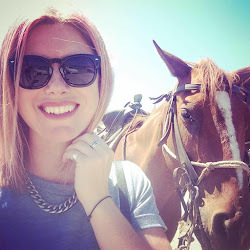 Do you have any tips for first timers like myself?